I couldn’t have been more excited! I’ve wanted for the last couple years to try glitter tattoo as I had seen it on tv and loved it and now this wish has come true. It is so easy to use and in the next days I will also upload a video tutorial on my YouTube channel with my first attempt. This post here is the second design I’ve created. With the other one on the video I did something more complicated. 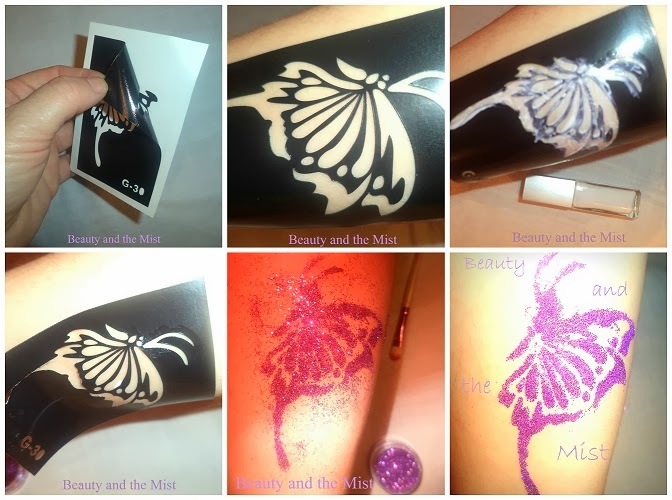 I have used Glitter Tattoo equipment from BornPrettyStore. The whole procedure is very easy and it requires less than 5 minutes. The kit includes 17 colours of glitter, 2 bottles of glue, two brushes and a packet of stickers. 1. On clean, dry skin place the sticker of your choice after you have peeled off the white backing. 3. Apply the glue on the skin showing through your stencil. In my case the glue contained a brush applicator which made it very easy to apply. 5. Dip the thin brush into the glitter and cover the area with the glue. You don’t have to be precise as the glitter will stick only on the area which has glue on. 6. With the large brush, first press the glitter on your skin and then wipe off the extra glitter. Your glitter tattoo is ready! The video which will follow in a couple of days will show a colourful glitter tattoo. For any purchase from BornPrettyStore you can use the code DKH10 and enjoy 10% off your order.